The Ram's Buttface Amber Ale is an American-style Amber Ale with 5.8% ABV and 25 IBU. I picked up a growler of Buttface Amber Ale earlier that day. It pours an amber color, with very good clarity and a thin, off-white head that has fairly short retention and slight lacing. There is a definite maltiness to the aroma. The taste was carmel malts, well balanced with the hops, and finishing with a sweet maltiness. It has a medium body, and low carbonation. 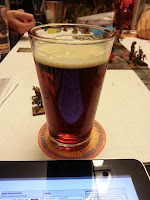 The Buttface Amber Ale is another solid offering on The Ram's regular lineup, and a good example of an Amber Ale (as evidenced by its victory at AMBERgeddon). An enjoyable beer that I will get when I'm in the mood for something a little lighter than the Total Disorder Porter.